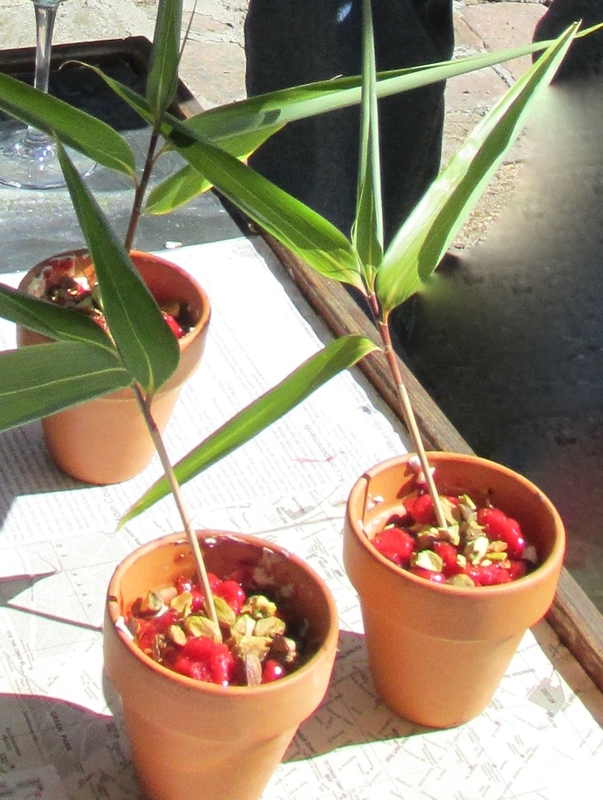 As a wonderful finale to a delicious long summer lunch last weekend, Mr MWCED made a berry granita, served in a mini flowerpot with a bamboo garnish. Inspired by a Heston Blumenthal tiramisu dessert served with a basil leaf garnish, this was full of mouth filling berry granita, (strawberry and raspberry), blueberries, a layer of mascarpone, finished with roasted pistachios. Oh, and a punchy surprise at the bottom of the pot, a cherry which had been infused in pinot noir (from Provisions of Central Otago). More to come about another dish or two from the lunch, but here is the recipe for our Potted Berry Granita. Make the berry granita (we made two : strawberry and raspberry) – for the strawberry granita we used 3 punnets of fresh strawberries( would serve around 6). Hull and cut roughly then mash and put through a sieve so you get rid of all the seeds. You’ll need to force the berry through the sieve. Then put into a pot with around 1/2 cup of sugar and 1 cup of water. Simmer for 10 minutes. Let cool then put into a non metallic shallow dish and pop into the freezer. Pull out once it is semi frozen and run a fork through the berry mixture to break up the ice crystals. Repeat about 3 or 4 times. Voila, ready to use. Then repeat with some raspberries or other fruit if you wish. Make sure your flower pots are pre washed. We plugged the hole at the bottom of the pot with a cherry infused in pinot noir (but with your wild imagination I reckon you could think of something just as yummy). Then a first (about a third of the pot) layer of strawberry granita, followed by a thin layer of fresh blueberries (which had been lightly simmered for 5 minutes with the help of a dessertspoon of sugar). After this a thin layer of mascarpone (with a little icing sugar added) followed by a layer of the raspberry granita. In Heston’s recipe he had a grated chocolate layer to finish, but I’m not a great fan of chocolate in desserts – and as it was my birthday I was allowed to choose – so we opted for crushed, lightly roasted, pistachios. To top it all off, some freshly cut bamboo to add a bit of green (though we didn’t eat that). Easy, eh?